Why not get involved in something a little different this summer? Join the Eagle Valley Club! We’re always needing volunteers for various projects around the center or just to do general upkeep. EVRC offers a variety of volunteer opportunities for young and old alike. 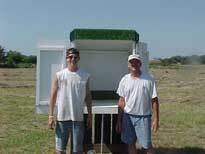 Everything from landscaping, painting, preparing diets, cleaning and constructing pens, and helping with tours. Contact Ken at 393-0710 if you’re interested. 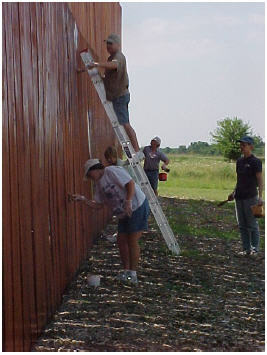 The first weekend in June, we had a group of volunteers out to help stain our large flight pen, an annual chore which goes much faster with more hands and brushes! 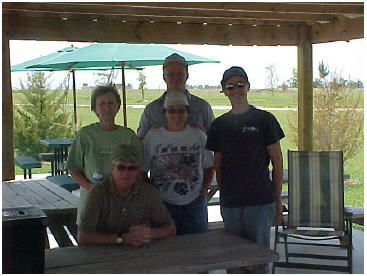 The Eagle Valley Club: Mary & Carl Herold, Jack & Peggy Willey, and Sharon Scheffler. I'd like to talk about the work that Chase Ingram did to complete his scout project. 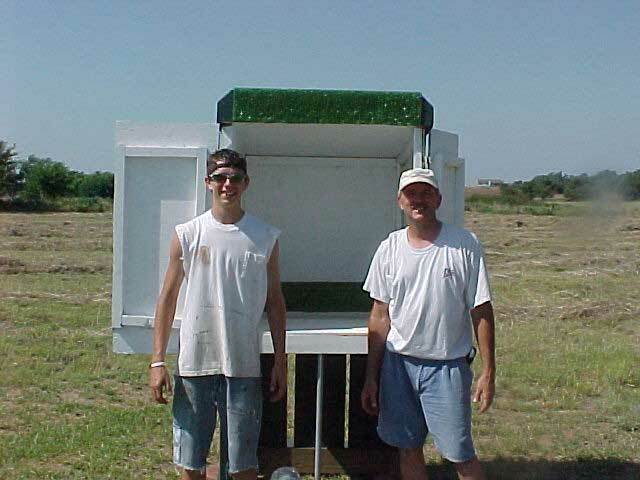 One of the photos is him and his dad in front of one of the Jump Boxes he made. The other photo is Chase and his fellow scout members staining the flight Pen. Chase earned a Eagle Scout Badge. 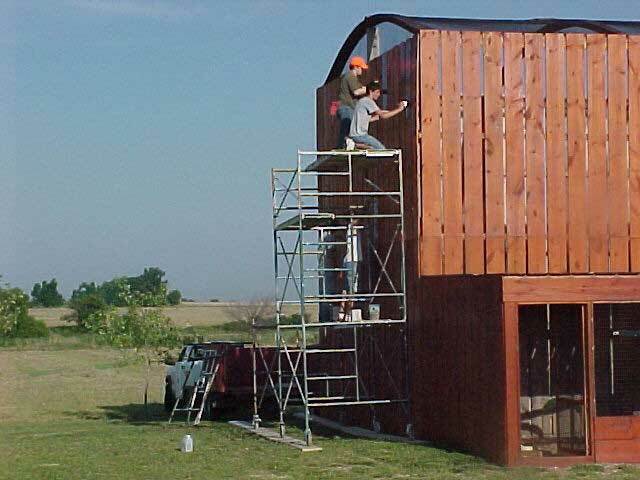 He had to plan his project, get all materials, and arrange and supervise any fellow scout members that helped. He was required to have a total of 100 hours to finish the project. He is from Troop 743 in Wichita, and did a great job. Then there is Mary & Carl Herold who are retired people that come out and volunteer, and also Sharon Sheffler a retired lady who volunteers weekly. They helped us found the Eagle Valley Club for volunteers. Wichita Fireman Mark Garcia has built several things for us. He also has come out and helped with repairs and reinforcing the holding and flight pens. Two students from the Zoo Science Program at Friends University took part in summer internships at Eagle Valley. Anna DiSalvo (on left) and Philip Nielsen (on right) first visited our center on a field trip with their Ornithology class. Their professor, Dr. Alan Maccarone, is a member of our board of directors, and encouraged his students to get involved. We were very excited about our first official student internships and are looking forward to hosting more in the future!